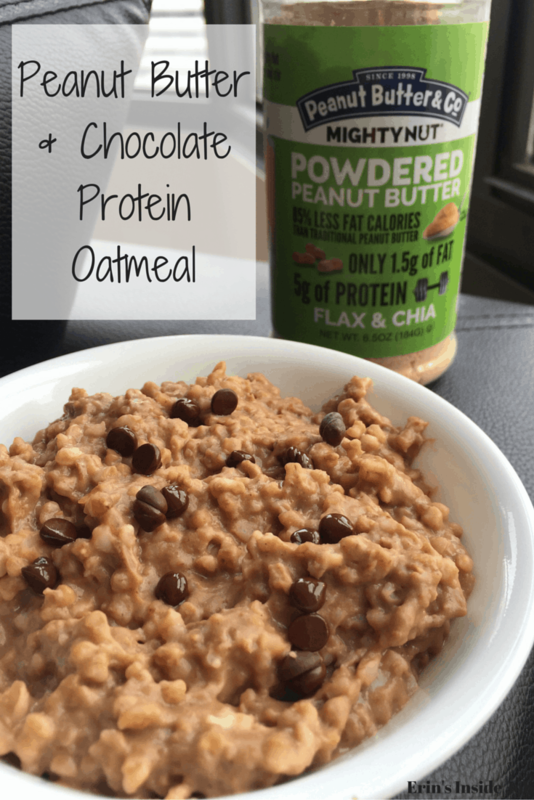 Peanut Butter & Chocolate Protein Oatmeal + A Giveaway! Disclaimer: This is a sponsored post by Peanut Butter & Co. on behalf of Fit Approach. All opinions are my own. Thank you for your support! Powdered peanut butter is a magical and mystifying thing. I remember buying my first container of it a couple years ago and thinking it was amazing. While regular peanut butter is still a staple in my kitchen, the powdered version is a great addition to throw in smoothies or cookies without changing the consistency around too much. Powdered peanut butter is made by roasting the peanuts, then pressing them to remove most of the fat. What remains is the protein, fiber, and delicious taste of peanuts. While healthy fats are an important part of my diet, I also tend to eat my weight in homemade almond butter throughout the day. Having a powdered version of peanut butter allows me to still enjoy the great taste of peanut butter without getting 95% of my daily fat calories from nuts. To rehydrate the powdered peanut butter, all you have to do is mix 2 Tbsp powder with 1 Tbsp of water. Voila! Since I am happily back on my workout game after struggling to find as much motivation the past couple weeks, I wanted to come up with a post-workout breakfast that would allow me to replenish the protein and carbs that I need after lifting ALL THE WEIGHTS. I made a large batch of steel cut oats in the rice cooker (super easy recipe here) the night before and divided it into 4 containers. In the morning, I pulled out one of the containers, added about a Tbsp of water, then heated in microwave for 30 seconds. Add Mighty Nut powdered peanut butter, 3 Tbsp water, and protein powder. Microwave for another 30-45 seconds. If at any point the oatmeal is too dry for you, just add water in small amounts until desired consistency is reached. Mix together, add drizzle of maple syrup, and top with mini chocolate chips for an extra treat. * If you want your oats to taste more like chocolate than peanut butter, simply increase the protein powder to 1 Tbsp and add slightly more water. ** You can also make this with regular oatmeal. Simply prepare your oatmeal as usual, then add in powders and sweetener and adjust liquid level accordingly. Peanut Butter & Co. is offering a free container of Mighty Nut to one lucky winner! The giveaway is open to U.S. residents only and will run until next Wednesday, November 4th at midnight. The winner will be able to choose from the original, flax & chia, vanilla, or chocolate flavors, so enter today for your chance to win!! I never tried the peculiar powder. It just seems a bit like space food. I think you’re convincing me to give it a shot! Thanks. I’d like to win the original and sprinkle it over my morning oatmeal with some bananas and bacon…Elvis style! flax and chia sounds great! I’d love to try the chocolate flavor. Yummy! Why is there not powdered almond butter??? Nothing boring about a classic! I want to win the chocolate flavor. I love powdered protein. I used to have a bottle of PB2…and loved it. Like you, I mostly consume Almond butter, but a powdered protein like this new PB & Co would be great to try!! YUM! I’m totally making this as soon as I find me some! OM NOM NOM!! I love PB & Co peanut butter so I am sure the powdered version will taste great too! The flax & chia flavor sounds interesting. original – so I can put it in anything! I love PB&Co regular peanut butter, and I’d love to try the powdered versions!!! This sounds cool!! Oh, Chocolate, all the time everyday.. I have never tried powdered peanut butter so I’d love to try the original. Although all flavors look great! I’m team chocolate. It sounds like the perfect addition to a smoothie! I get my flax meal and chia seeds pretty regularly but not my chocolate fix. I would love the chocolate flavor! I didn’t think I’d love this MightyNut as much as I do!! I’ve been mixing into my Greek yogurt, and it’s better than trying to stir in a huge chunky glob of PB hehe. I’d love to try the vanilla version! I’d like to win the flax & chia flavor. I would love to win the chocolate flavor! I would love to have the original flavor! awesome! flax and chia for sure. mmm that sounds like a nice exit from my current food rut. I want to win the Original flavor! I would love to win the Original! I want to try it in my oatmeal & eat it with apple slices! The flax and chia for sure! I would LOVE to win the vanilla. I use powdered PB all the time in my smoothies, so this would be awesome to try :). This oatmeal sound perfect for healthy beginning of a day! Love the combination of ingredients, Erin!